This book follows a few months in the life of Luke Millward who finds himself thrust into the wake of post-Katrina New Orleans in an effort to find his father, Charles. You do find out more about Luke and his relationship with his father through a series of flashbacks. The overall feeling that I had while reading this book was a humbling yet tragically deep sense of sadness. It does make you powerfully think about redemption and second chances. If Jessica Alba had a better-looking sister, it could be Bela. As I appreciated her striking good looks, I predicted one of her parents was Latino and the other Caucasian. One of the character's that stood out for me was Jordan. She was very kind and a good friend to Luke. I felt so bad for her in so many ways becuase you could tell that Luke didn't have the same emotional feelings about her that she did for him. In the end, she shows an amazing amount of grace that is very endearing. I would love to read a sequel about Jordan and get to know her story better. I also really liked Luke's father, Charles, even with all of his imperfection and addiction. I liked that he was a musician and the idea that we can write a "second verse" to our lives. So, the incorporation of his song into the book was really neat and adds to the way the book felt. If you'd like to read the lyrics or listen to his song, it is found here. I do wish that it was sung by a woman like the character Bela did in the book though. I also think the way that post-Katrina New Orleans was presented and described was accurate and well-researched. These grim details could have been a minor part of the story but were poignant and insightful instead. Overall, I had a lot to think about after I read this. You've read another book by this author before, right? Was it the Wednesday Letters? I can't remember. I'll have to look at your list in a minute. If you have read another of his books, how did the two compare? Which did you like better? Yes, I have read another book by Jason Wright and it was called The Wednesday Letters. In The Wednesday Letters, it seemed hopeful and had examples of unconditional love in it. In Recovering Charles, it was different because it felt tragic. 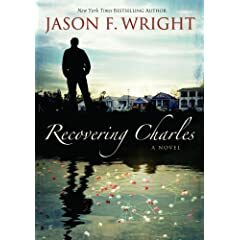 I felt more for the characters in Recovering Charles than I did in The Wednesday Letters where I felt more involved in the plot there. I'd have to say that I did like Recovering Charles better because it was more interesting & unique with the flashbacks of insight into Luke's life and the post-Katrina events wrapped up into it. Although, I might recommend The Wednesday Letters more, on a whim, to others because it felt like it might be more universally appealing. I heard you speak in person once and I thought you were great to listen to so that does keep me reading your books. Looking forward to reading & reviewing your next one.